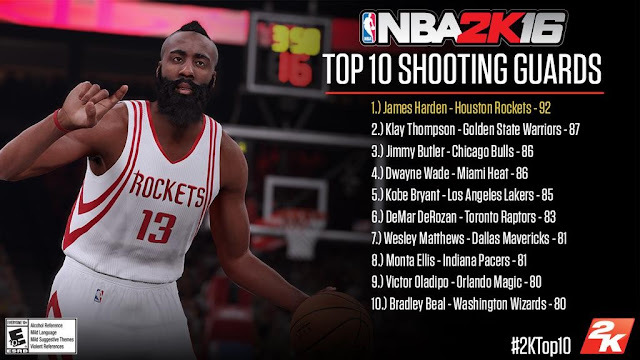 2K Sports is in the middle of rolling out their player ratings for NBA 2K16. Yesterday the ratings were revealed for the top rated point guards in the game. Today the attention shifts to the shooting guards. Topping the list is three-time NBA All-Star, James Harden with the rating of 92 overall. Check out the full list below. What do you think about 2K’s reveal so far? Share your thoughts in the comments below. Check back to see the next batch of ratings reveal The game is set for release September 29 on PlayStation 3, PlayStation 4, Windows PC, Xbox 360 and Xbox One. For more on the game, check out our NBA 2K16 page.